On October 21, 2014 it will be exactly 70 years since U.S. troops liberated Aachen and its citizens. 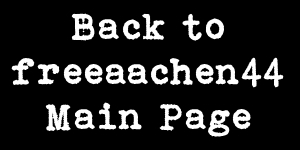 Aachen was the first German city to be liberated and to embark on the path towards peace and liberty. The Community Foundation “Lebensraum Aachen” recalls this historic moment. Students from Aachen and from the U.S. twin city Arlington/VA have been invited to discuss the subjects of “Peace and Liberty”. Central questions were: What is the significance of these subjects for us students today? And which orientation do they implicate for our personal future? 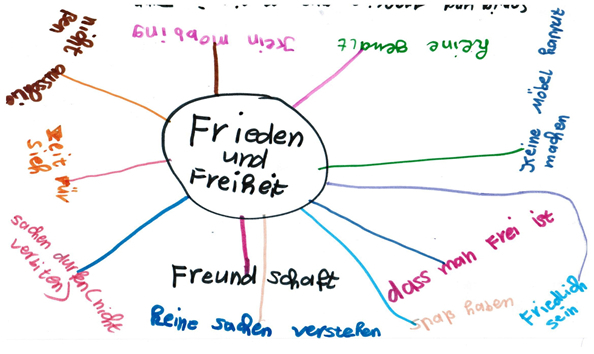 Students of the Käthe-Kollwitz-School in Aachen wrote down their opinions on the question: „What does it mean to me that I can live in peace and freedom?” The students will complete their training for childcare assistants in the near term. 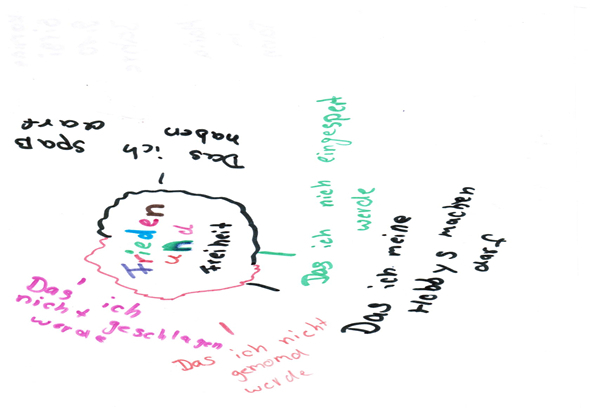 Together with Doris Kühne, specialist subject teacher for practice social education, the students discussed the meaning of peace and liberty. The abduction of more than 200 girls aged 12 to 17 in north-east Nigeria gave additional rise to the debate. In the following, you will find the young women’s opinions. For me, peace means human security: a dignified life for all people, without hunger and misery, a life with people showing tolerance towards the other. Peace also means that I can leave the house whenever I want without having to worry whether the sirens will start to sound or whether the streets will be bombed…. It means enjoying family evening at home and sleeping without being awakened by soldiers and bombs and without being maltreated in one’s own home. Every human being has the right to peace. Just as when my father went to the alien’s department together with me, my siblings and my mother, and fought for his family not to be expelled. To me, peace means that no one is to be expelled. Nowadays, we do not appreciate peace. We only know our carefree lives. War and death seem far away. We do not know how fortunate we really are. Peace is a natural state here. We tend to forget that this is not the case everywhere. If I ask myself what living in freedom means to me, I look back on my childhood. When I was 13 years old, I lived ten meters from the Dutch border. Without any border controls I could cross this border every day with my family, pets and friends. I had a horse whose name was Freedom and when riding out I had the incredible feeling of freedom. I would like to tell of this wonderful feeling. Freedom and me, we rode in the Dutch woods every day. We jumped over trees, stones and sticks, stormed over fields and sandy paths. The best thing was to gallop. I loosened the reins, threw my hands in the sky and felt the air through my whole body. Freedom took me on a very unique trip. Dreams dawned and I could almost feel the freedom. Grief, anxiety, worries, sadness, and thoughts were gone. This feeling is indescribable: You just let go and dream. After that, I always felt like a new person. On other days, I cared for Freedom or slept on its back. The horse seemed rooted. It looked out for me, ran behind me, free as a bird. It was a time full of confidence, boundless and blind trust. Now I travelled through time once again. It was a pleasure for me to tell you about my view of life in peace and freedom. For me, peace does not exist, because there are people fighting war. As if that were not enough, even children die. People are living in constant fear and are hungry. People do not show mutual respect. They avoid each other because of the color of their skin or different opinions. To me, peace means that all people can live without fear and without war and hunger. People should have enough to eat every day. I have everything I need, but to live in peace, I must know that all people are doing well. We have to be grateful for everything we have and we have to share. And we have to stop making each other’s lives hard. For me peace is when my life is not constantly threatened. To me, living in peace means not to be afraid permanently. Peace concerns all of us, regardless of whether someone lives in the east, west, south or north, regardless of whether someone is rich or poor. Everyone has to deal seriously with the question of peace. We are all human beings and we all share the same concern: being happy and living a happy life. We all deserve to live a happy life. Peace means to me that I can feel safe, have my family around me and claim my rights. It is a privilege for me to live here (in my life). My life has been given to me. I have neither worked for it nor did I have had a bearing on it. When thinking about the poor girls who have been sold to the soldiers, I am shocked about what things happen in the world. For many children and young people from Aachen in Maria im Tann, peace is taken for granted. At least, this is the impression you get when confronting them with these terms. Peace and freedom are referred to the political dimensions of “no war” and “no oppression”. Luckily, they did never experience war and oppression. Of course, they know that there are countries where war and oppression prevail. They are sad about it, but they cannot really imagine living in such regions. However, meanwhile this issue has become more and more apparent for children and young people whose parents live in the Aachen region. In Bangladesh there is no war. However many people are not satisfied. There are many accidents, for instance severe ship or traffic accidents, poor working conditions so that many people die by fire. There is always war in Africa, no peace, no freedom, so Africa is not beautiful. There is much war in Afghanistan, there are many Taliban. Boys cannot go to school. There is always war in Guinea, no peace. Guinea is not beautiful. In Eritrea there are many problems, no school; always war and one gets beaten. Germany is very beautiful. I have always peace and freedom. Germany is very good. All boys can go to school. In very simple but strong words, these statements show these young people’s concerns. Knowing that one of them saw his father’s beheading by the Taliban, that another could not rescues his brother from drowning and that there are many other atrocities, one can understand that living in peace and freedom is anything but a matter of course for these immigrated young people. Their start into a more peaceful and just future here in Germany is accompanied by incredibly high hopes and expectations. All of them suffered from traumatic experiences before and during their escape. They are full of sadness about having lost their families – at least about having left them for a long time. Those who become acquainted with the young refugees know that they must do everything in order not to destroy their hopes. Gratitude for 70 years of peace and liberty in Aachen also means that we have to support those who seek refuge in this city. It is not least the current knowledge about the after-effects of trauma caused by the dreadful experiences during the Second World War that obliges us to help the young refugees so that they can organize their lives, healthier and more future-oriented. “Freedom means to me that I can freely decide in my country how my life should look like. I can choose the profession I want to learn and I am very pleased with this situation, because in my opinion, everyone should have this choice in order to be happy with one’s life and job. Even though my parents have determined many things in my life, they had the possibility to make free choices as well. No one told them how to bring me up or which school they should send me to. When I was too young to shoulder responsibility, they decided for me. I still felt free and the older I got, the more I was allowed to have a say and I appreciate it. Last year, when I chose to do a voluntary social year, it was my own decision and I felt that I was free to decide on my own. Now, I am also free to choose an apprenticeship. For me, it means a great deal of freedom that no one prevents me from taking up the training of my choice. It makes me feel grown up and prepared to take over responsibility for my own life, whether or not others are pleased with it. It is my free choice. For me, freedom of expression is an important aspect as well, because I can hold and express my opinion whenever and wherever I want. No one tells me what I should or should not say. My opinion can be criticized, but that is nothing to worry about. The main thing is that I can express it without fearing condemnation or the like. For me this is normal but there are many places in the world where people live in less fortunate circumstances. That’s a real shame! All people should have the right to freely express their opinions. I could not imagine people prohibiting me from doing so. I would feel constraint in terms of my personality. Freedom means to me that I can show my creativity, meaning that I can choose my own clothes or hairstyle. It is my own decision and no one tells me my opinion anymore. There was a time my parents decided for me, but now I am old enough to decide what is the best and right for me. I can arrange my room, or later my flat, according to my wishes. I can also choose my hobbies, because I know what I like and what is fun for me. In the dancing group, I can live my creativity and I think it’s good that I choose this hobby myself. I live in Germany and there is no war in this country. Therefore I am not restricted in my way of life as many people are. I can freely develop and find complete expression. My parents, the school and my social environment influenced my principles and values, but I was free to form my own opinion. In the future, there will be many decisions that I will make on my own, as for instance, where to live, who I will marry and how many children I want to have. I am often unaware of what a gift it is to be free and to live in freedom. For me it is a matter of course and I could not imagine that it could be different. As long as young people like Alexandra think of peace and freedom in this way, if they shape their lives in a meaningful way and show such a high level of commitment and responsibility for others, and if they share these values with their children, then we are well on the way to creating more peace and freedom in the coming 70 years.